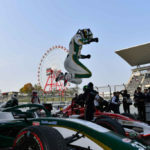 New Zealand Grand Prix and Toyota Racing Series champion Nick Cassidy had a perfect start to the Super Formula Championship with a first-round win at Suzuka Circuit in Japan, during the Easter weekend. 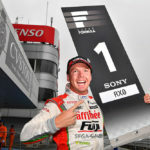 Starting 12th on the grid in his new Vantelin Team TOM’S Toyota-powered Dallara SF19, Cassidy looked to be an outside chance for even a point from the..
After a successful 2018 racing season in Japan, New Zealand driver Nick Cassidy will continue to drive for Lexus and Toyota in Japan’s two premier classes, Super GT and Super Formula in 2019. “It’s great to be able to continue my relationship with Lexus and Toyota Gazoo Racing for 2019. 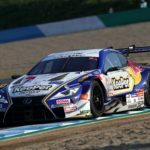 Both series have great momentum at the moment and it’s..
For the second time in a fortnight Nick Cassidy has had to swallow the bitter pill of finishing runner-up in both of Japan’s premier motor racing series. With co-driver Ryo Hirakawa the pair’s Lexus LC500 finished just 1.5 seconds behind 2009 Formula 1 World Champion Jensen Button and his co-driver Yamamoto Naoki. The two teams went into the 250 kms..
Aucklander Nick Cassidy has finished just 0.654 of a second away from winning Japan’s Super Formula Championship at Suzuka on Sunday. 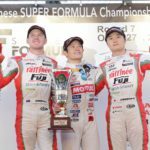 The 23-year-old, finished second behind Naoki Yamamoto, who won the title by one point from Cassidy, who was driving a 600-horsepower turbocharged Toyota single seater. “It was a great fight,” said Cassidy who came from nine seconds behind with..
Nick Cassidy will take a four point lead into the final round of Japan’s Super Formula at Suzuka next month after finishing fifth in a chaotic race at Okayama on 9 September. 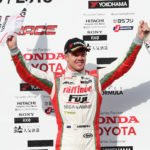 The 24-year-old Aucklander in his turbocharged Toyota powered Dallara and the rest of the field spent more time behind the safety car and under full course yellow flags..
Nick Cassidy celebrated his 24th birthday on Sunday with the best present possible – taking the lead in Japan’s Super Formula series with a third place at the 52-lap Motegi race. 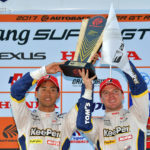 The Aucklander now leads both the country’s major championships after finishing second in the Fuji 500 miles a fortnight ago in the Super GT series. Cassidy, a double winner..